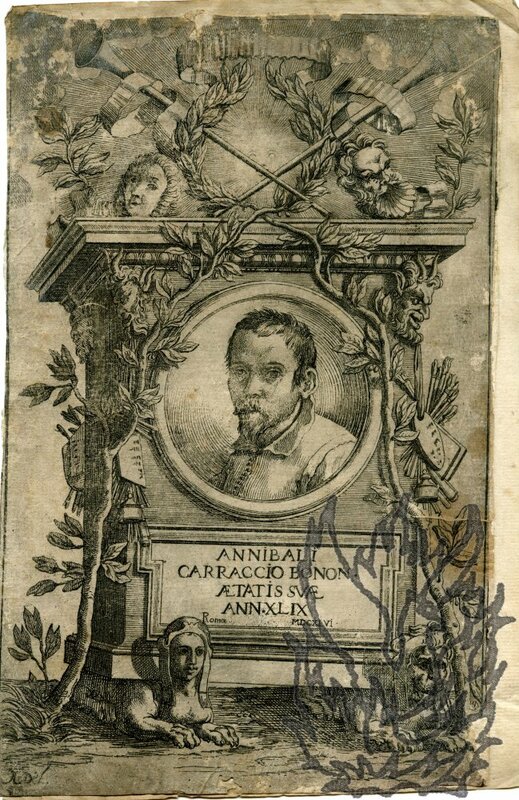 Engraving, with portrait of the artist, of Carracci's funeral memorial. Dimensions of print roughly ten inches by six and a half wide. Mounted on a slightly larger piece of laid paper. Rubbed, worn and heavily aged, with small wormhole at foot. Ornate tomb with sphinxes, ivy, masks, palette, laurel wreath, etc. 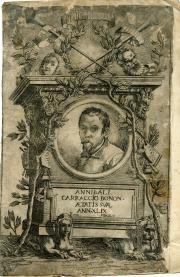 Central head and shoulders image of Carracci, above caption 'ANNIBALI CARRACCIO BONON. AETATIS SVAE ANN.XLIX Romae MDCXLVI'. 'A. Del.' in bottom left-hand corner. This is NOT the engraving by Pietro Aquila, after Carlo Maratta, in Aquila's 'Galeriae Farnesianae Icones' (1674).